We are a small locally owned and operated family business. Both my husband and I were born and raised here in Hawaii along with our 2 amazing sons. Our business “Kauai Baby Gear” consists of myself, my husband and our 2 bosses, our 2 sons and you will often see us as a family doing our deliveries and pickups. We started this business because as a family who loves to travel we have encountered and understand the frustration of not having what you need to enjoy your time while on vacation with your children. We knew that we could offer great quality baby gear rentals to all families visiting Kauai with outstanding customer service they could count on! We run our business with love and care. You are not an invoice number to us or just another buck to make (okay your money does help feed our family), you are an opportunity for us share Hawaii’s Aloha spirit. This might sound very corny, but you’re not just doing business with us, you are gaining a family friend. We truly care about each and every family that rents from us and do our best to strive for outstanding customer service. How we differentiate our business “Kauai Baby Gear” from our competitors is very simple, we focus on our customers and our service. We will go out of our way to make sure that your vacation here on Kauai with your family is amazing. I personally research and purchase each product that we carry and know everything about it. I personally take care of, sanitize, and inspect every inch of every product before and after every single rental, NO EXCEPTIONS. I will not rent out any piece of baby gear that does exceed my highest standards. I pride our company on our honesty, fair pricing, caring heart and FUN!!! We love what we do and we love teaching our children about running a small business and having high business ethics and morals. 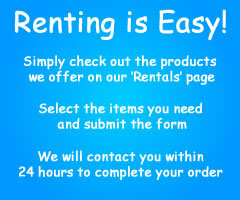 We look forward to hearing from you and have high hopes that you when you visit Kauai and need to rent baby equipment you will entrust us with your business.